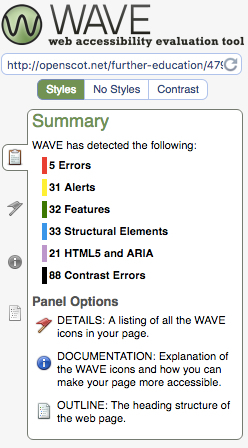 Thing 6 is all about web accessibility and it’s a thing I have had a very on and off relationship with over the years. Despite the fact that I am fully signed up to the belief that accessible design is good design for all, I think I probably pay less attention to accessibility online than I did ten or fifteen years ago. When I used to build websites for other people, I made a point of trying to ensure they were as accessible as possible within the constraints of the web browsers of the day. It’s a long time since I actually built a website though, most of the content I now put on line appears on blogs or social media platforms which come with their own user interface or stylesheets. Consequently I’ve got very blase about accessibility because the design of the user interface is usually beyond my control. However I know I’m just being lazy and there is a lot more I could be doing to make sure my blogs are accessible, so it was really interesting to run one of my blogs through the Web Accessibility eValuation Tool. The blog I chose was the Open Scotland, a simple WordPress blog running on Reclaim Hosting and you can see the results here. To be honest most of the errors and alerts didn’t surprise me as they relate to heading abuse and images without alt text. One thing that did surprise me though is that justified text is problematic. This made me very sad, because I love justified text and I justify all my blog posts and documents. I will have to try and wean myself off justification, starting here today. I still think unjustified text looks messy though. Also as an aside, when I used to work in technology standards development I had a very peripheral involvement in some of the web accessibility standards groups. I was never actually a member of any of the working groups but I was occasionally called in to comment on metadata issues. Negotiating consensus in standards working groups is never an easy task but in the accessibility groups it could be particularly fraught, so kudos to all those to worked hard to bring these standards to fruition. Can open stop the future? 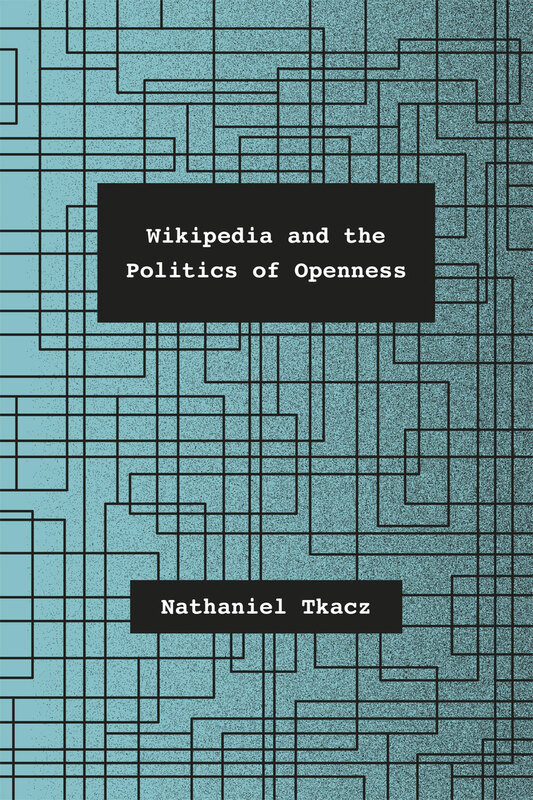 Last week Catherine Cronin brought Alice Marwick’s review of Nathaniel Tkacz’s Wikipedia and the Politics of Openness, to my attention and it’s left me with a lot of food for thought. I haven’t had a chance to read Tkacz’s book yet but there are a couple points that I’d like to pick up on from the review, and one in particular that relates to the post I wrote recently on Jisc’s announcement that it intended to “retire” Jorum and replace it with a new “App and Content store” : Retire and Refresh: Jisc, Jorum and Open Education. I tend to shy away from socio-political discussions about the nature of openness as I find that they often become very circular, and very contentious, very quickly. I do agree with Tkacz and Marwick that openness is inherently political but I certainly don’t believe that openness is intrinsically neoliberal. To my mind this analysis betrays a rather US centric view of the open world and fails to take into consideration many other global expressions of openness. If I’m interpreting Marwick correctly, Tkacz also seems to be arguing that openness must necessarily be non-hierarchical, which is an interesting perspective but not one that I wholly buy into. While I think we need to be aware of the dangers of replicating existing hierarchical power structures in open environments, I think it’s somewhat idealistic to expect open initiatives to flourish without any power structures at all. So yes, there are hierarchical power structures inherent in Wikipedia, but I think there are many more egregious examples of openwashing out there. 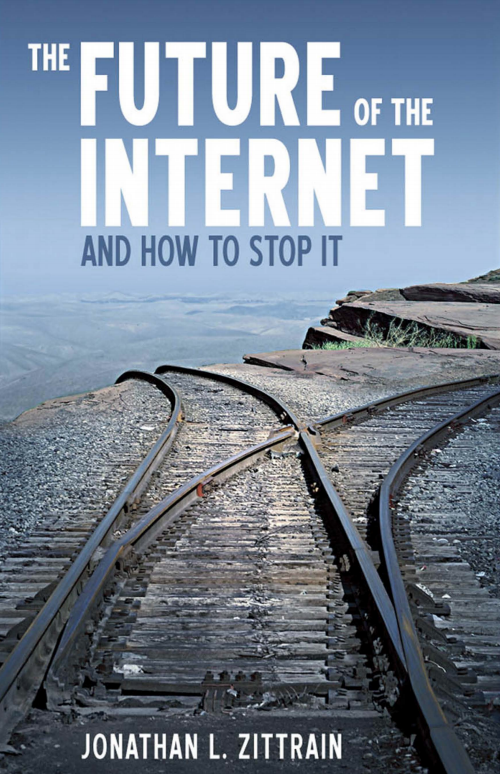 The point that really struck me in Marwick’s review was the reference to Jonathan Zittrain’s 2008 book The Future of the Internet – And How to Stop It in which the author charts the evolution from generative to tethered devices. Marwick elaborates on the this generative – tethered dichotomy and situates it in our current technology context. “Those in the former (generative) group allow under-the-hood tinkering, or simply messing with code, are championed by the maker movement, and run on free and open-source software. Tethered devices, on the other hand, are governed by app stores and regulated by mobile carriers: this is the iPhone model….The most successful apps of today, from Uber to Airbnb to Snapchat, are participatory and open only in the sense that anyone is free to use them and generate revenue for their owners. Now, I’m not sufficiently familiar with Zittrain’s work to know if his thinking is still considered to be current and relevant, but his warnings about a future of closed technologies tethered to a network of control, rather amplified the alarm bells that have been ringing in my head since Jisc announced the creation of their App and Content store. As I mentioned in my previous post, the idea of an App Store sits very uneasily with my conception of open education. Also I can’t help wondering what role, if any, open standards will play in the development of the new app store to prevent lock-in to proprietary applications and formats. Zittrain suggested that developing community ethos is one way to “stop the future” and counter technology lockdown. I absolutely agree that when it comes to the development of education content and technologies we need a community ethos with shared norms and a sense of public purpose, but to my mind it’s increased openness, rather than more locks and keys that will provide this safeguard. In the past Jisc played an important public role by fostering communities of practice, supporting the development of innovative open technologies and sharing common practice and I sincerely hope that, rather than becoming a single gatekeeper to the community’s education content and applications, it will continue to maintain this invaluable sense of public purpose. Having been involved with the LRMI project for the last year, I’m well aware of the significant time and effort that has gone into establishing a robust and sustainable governance model to ensure that the LRMI specification is curated and maintained beyond the initiative’s funded phase. 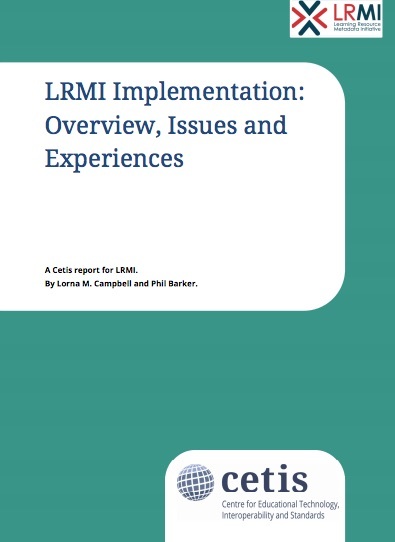 The project team strongly believed that LRMI required a governance model that preserves the open, collaborative, user-driven nature that has characterised the development of the specification, while also providing a path to formal standardization and the credibility and fidelity that accompany it. With its strong track record of supporting communities of practice around metadata design, innovation and best practice, the Dublin Core Metadata Initiative is well placed to meet all these requirements. You can read more about the agreement to transfer LRMI to DCMI here LRMI Transfers Stewardship, and my colleague Phil Barker has written an excellent blog post about what this means for the future of LRMI here LRMI Moving to Dublin Core. Last week my colleague Phil Barker and I published a new technical briefing paper What is schema.org? This briefing has been produced as part of our work with the Learning Resource Metadata Initiative (LRMI). LRMI expands schema.org so that it can be used to describe educationally significant characteristics of resources. At a technical level, the first step to understanding LRMI is to understand schema.org. What is schema.org? describes the schema.org specification for a technical audience. It is aimed at people who may want to use schema.org markup in websites or other tools, and who wish to know more about the technical approach behind schema.org and how to implement it. As such, it has relevance beyond the description of educational resources, and we hope it will be of interest to anyone describing resources on the web. Additional briefings providing an in-depth technical overview of LRMI will follow. The Learning Resource Metadata Initiative is funded by the Bill & Melinda Gates Foundation, and jointly lead by Creative Commons and the Association of Educational Publishers—now the 501(c)(3) arm of the Association of American Publishers—with the aim of making it easier to publish, discover and deliver high quality educational resources on the web. With input from a wide range of organisations, from both the open and commercial spheres, involved in publishing, creating and using educational resources, LRMI successfully proposed additions to schema.org (an initiative of Google, Yahoo and Bing) allowing the description of educationally important properties of resources to be marked-up in web pages in a manner that is easily understood by search engines. This enables users to create custom search engines that support the filtering of search results based on criteria such as their match to a specific part of a curriculum, the age of the students, or other relevant characteristics. I’ve being working in the domain of learning technology and interoperability standards for over ten years now, and during that time I’ve worked with a number of standards bodies including IMS, BSI, DCMI, IEEE and ISO SC36. However the first standards body I ever worked with was the CEN/ISSS Learning Technologies Workshop when I joined the Taxonomies and Vocabularies Project as an independent expert in 2001. The European Committee for Standardisation’s Information Society Standardisation System (CEN/ISSS) was formed in 1997 to provide a focus for CEN’s ICT standards activities. There are currently 12 formal Technical Committees and around 17 less formal Workshops in the domain of ICT. The outputs of CEN Workshops are published as CEN Workshop Agreements (CWAs) which are disseminated freely and openly. CWAs can be regarded as pre-standardisation documents, reports and specifications. Within the Learning Technology Workshop, some of these CWAs are produced as a result of EU funded projects, but others have been produced on a voluntary basis by members of the workshop. Although I haven’t personally been involved with the Workshop for a number of years, Cetis has remained an active participant and several of my Cetis colleagues regularly attend meetings and contribute to Workshop activities. Simon Grant has been a notably active Workshop participant in recent years, during which time he was involved in the development of the Integrating Learning Outcomes and Competences (InLOC) specification which was published as CWA 16655 1-3 in July this year. The InLOC CWA documents can be downloaded from CEN here. Having been involved in a number of standards bodies over the years, I have always found the Learning Technology Workshop to be admirably open and inclusive. The Workshop is open to all interested parties and any member can propose or contribute to an activity, provided they have the time and resources to participate. Although there has been limited financial support for EU funded projects, a huge amount of valuable work has been carried forward on a voluntary basis by members of the Workshop. And perhaps most importantly, the outputs of the Workshop, the CWAs, have been made available freely and openly. The development of open learning technology standards is largely driven by the goodwill of technical experts and educational practitioners who contribute their time, energy and expertise on a voluntary basis, and I have always felt that it is important for standards bodies to promote open development processes and to disseminate open outputs. Consequently it’s of considerable concern that a serious disagreement has arisen between CEN and the Learning Technology Workshop regarding the free and open dissemination of the Workshop’s CWAs. In a nutshell it appears that CEN have suggested that only CWAs produced by EU funded projects can be made available free of charge. This position suggests that CWAs produced by unfunded voluntary projects should no longer be published as free open documents and calls into question the viability of the Workshop in its current form. As this issue remains unresolved, the latest meeting of the Learning Technology Workshop has been cancelled and the Workshop Chairs have called a public online consultation meeting on the 15th of October to discuss the future of the Workshop. If you have any interest or involvement in the creation of open standards and specification within Europe, or a commitment to the development of open education technology, I would strongly encourage you to attend.